The first weekend of November, something close to 100 artists descended upon Golden, Colorado for three full days at Art Biz Breakthrough. Hosted each year by Alyson B. Stanfield, well-known and well-loved business coach for artists, it is truly a life-changing event for many who attend. What was my Breakthough this year? I came to grips with the fact I really want to move away from wheel-thrown work to make wall sculpture, figurative sculpture, totem poles, obelisks, who knows? I want to tell tribal stories, family stories, funny stories, MY stories in a way that has more impact than a simple turned pot. Don’t get me wrong, throwing is my first love and not likely to disappear completely, but you can expect to see fewer of those as this new body of work comes to life. 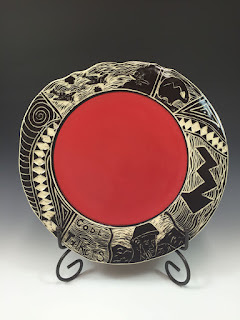 Sgraffito will always find its way into my work, we’ll see just how that happens. Ideas are flowing faster than I can get them into a sketchbook. I’m beyond excited…and slightly terrified, but determined. John D. Rockefeller once said, “Don’t be afraid to give up the good to go for the great.” That is my mantra for 2017, so look out world! Alyson B. Stanfield is the author of I’d Rather Be in the Studio – The Artist’s No Excuse Guide to Self-Promotion now in its 3rd edition, and founder of Art Biz Coach. She is a no-nonsense coach of the highest caliber and I have been privileged to work with her for the past two years. Through on-line classes, one-on-one coaching, and her Inner Circle of artists in all manner of media, we are laser focused on treating our art career as a small business and…dare I say it…making money as professional artists! For 32 years I had to get up at the unearthly hour of 5:00 am, sometimes 4:30 (ugh) – or depending on where I was in the world and what time my flight was departing, even earlier. But no more! I retired from aerospace in 2009. Now I can sleep in to 6:30, maybe even 7:00 – what a luxury that seems to me (most days). Why so early you say? To have coffee on the back porch with my adorable husband. To drink in the peace of living in the country. To feed our three fur babies and give them lots of love. To walk the 100 feet to my studio, stretch a little, sketch a little, and plan my day. 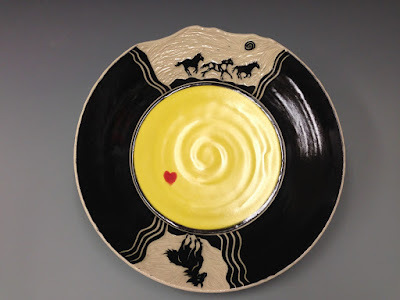 To get my hands in the clay…to throw, trim, carve, and fire the art I so love to make. Yes, I am truly blessed to be living the creative life I’ve dreamed. I am profoundly grateful every day for that blessing. It breeds happiness. I hope you have five good reasons to get up in the morning. Please share with us some of your best reasons for rolling out of bed. And if you can’t think of five…that’s okay, just be grateful for those you have and before long, your list will grow…and grow…and grow. P.S. If you haven’t already, be sure to sign up for my Studio Insiders email list – there are some fun things coming soon just for you! Click the button below, with the assurance I will never share your information. Yes, I know it’s only October, but I want you to have plenty of time to get involved. If you’re a fan of my handmade, hand carved, black & white sgraffito mugs with the bright color inside, then this is important…they will only be available during my first annual Merry Mug Madness on-line sale after Thanksgiving. Get notified first, before I announce it to the world! When they’re gone, that’s it. I’m working hard to have a big selection but can’t promise how many mugs will be available. So…if you are not already…please click the button below to sign up for my Studio Insiders email list. You won’t hear from me every week but when you do, I promise it will be juicy stuff I share. AND I promise never to share your information, ever. This week we’re headed to Tulsa for the Cherokee Art Market, October 8-9, at the Hard Rock Casino. If you’re in the area, please stop by & say hello! And because I truly value your support, I am offering free shipping in the US on all Lidded Jars, Altered Vessels, & Plates and Platters. This offer may not last forever, so don’t miss out! You will also have easy access to my Small Works with just a click-to-buy through my Etsy store. Studio Insiders will receive notifications of on-line special events, like the Merry Mug Madness sale coming up for the holidays. If you haven’t already, please sign up so you won’t miss out on the fun. I promise not to fill your inbox with pottery press and I will never share your information…with anyone – ever. Red Earth is an event dear to my heart. 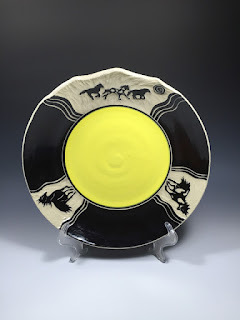 It is an organization committed to promoting the rich traditions of American Indian arts and cultures through their museum and fine art markets. For 30 years, the Red Earth Festival has showcased Native American artists and dancers during its 3-day event in Oklahoma City. 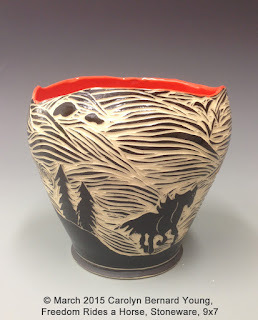 I was honored to be awarded 1st Place in Contemporary Pottery this year for my lidded jar titled, Terrapin Races Rabbit II. For the first time ever, I danced in the Grand Entry, dressed in traditional Choctaw regalia. You may have seen traditional Native American dancers or witnessed a Grand Entry and thought it colorful and entertaining. Have you wondered about the different “costumes” (for the record, the correct term is “regalia”) and dance styles? Let me tell you a little of what I have learned. A Pow Wow, sometimes called a Festival, is a gathering of Native American tribes to celebrate with singing and dancing to honor their cultures. A Grand Entry is held at the beginning of each session – usually one on Friday night, two on Saturday (noon and after dinner), and one on Sunday afternoon. The dance arena is first blessed and is considered sacred ground for the duration of the celebration. followed by Flag Bearers carrying the American flag, state & tribal flags, and often the MIA-POW flag. Everyone is asked to stand and dancers are reminded they are “dancing for their ancestors”. The procession continues in a circle around the arena, adding ever more dancers, matching their steps to the beat of the drums. Once all the dancers are in the arena, a song honors the Eagle Staff and flags. A prayer is offered, followed by a victory song while the Eagle Staff and flags are placed in their standards. Each group of dancers is led by a Head Dancer, who represents their particular style of dancing. Head Dancers are selected for his or her knowledge of tribal traditions and customs, as well as their own dance reputation. It is an honor to be chosen Head Dancer, to serve as leader and model for the rest of the dancers. Our Head Dancer was Carol Ayers (in yellow), a fellow Choctaw artist, friend, and the one who mentored me through the Grand Entry process. Her last words to us as we entered the arena were, “Hold your heads high ladies, we are dancing for our ancestors!” And we did. Tears of joy streamed down my face, yet I couldn’t stop smiling. I was dancing in the Grand Entry at Red Earth – for my mom! My dress was a traditional Choctaw dress with apron, hand made by fellow Choctaw artist Judy Davis. Notice the diamond pattern, found throughout Choctaw culture. It is the Choctaw symbol for respect for nature and is found somewhere on almost every piece I make. The exquisite beaded collar and earrings were created especially for me by Chester Cowen, fellow Choctaw artist and tribal historian. The feather fan I carried was purchased in the Badlands of South Dakota and hand made by a Navajo artist. 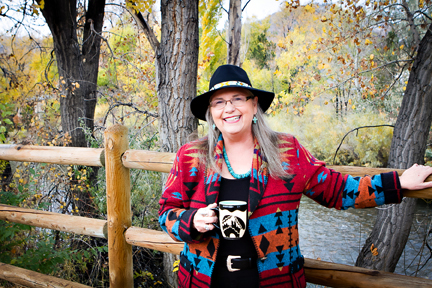 My shawl with the 18″ fringe was purchased in Oklahoma. Close up of Choctaw diamond pattern on the dress and beaded collar. Other women’s dance divisions include Northern Traditional, Fancy Shawl, Jingle Dress and Buckskin. Men’s divisions include Northern Traditional, Southern Traditional, Fancy Dance, and Grass Dance. Depending on the location, inter-tribal and community dances may also be included such as the Southern Plains Gourd Dance, a society dance for veterans and their families. I am no expert, but this reflects what I have learned. Tribes have their own social dances and ritual dances that may or may not be performed for the public. For me, this experience touched my soul. I hope my sharing it gives you a peek into the rich culture of Native Americans. If you would like to receive monthly articles like this, please sign up here to become a Studio Insider. Five Civilized Tribes Museum show where two of my pieces had received awards that same week. As luck would have it, the annual Azalea Festival was taking place just next door at Honor Heights Park. What a treat! It was a lovely drive through the 40 acre park and the azaleas were stunning. We spent a peaceful afternoon enjoying the beautiful flowers and park landscape in a city new to both of us. Just one of many perks of my artful journey. Once again I was struck with just how lucky I am to be doing what I love, living the creative life I’ve always wanted. We had dinner at the Okie’s Steakhouse, where they were playing Merle Haggard music non-stop (just days after we learned of his passing). “Okie From Muskogee” was sung by everyone in the place. No, I’m not an Okie but I’m a Choctaw, and my mom was an Okie, so it’s like a second home to me. What kind of Springtime Adventure do you have planned (or have you already done it?) Comment below and tell us all about it! Join me next month for our Bucket List Trip to Crazy Horse, with a side trip through Santa Fe (and a BIG announcement!) – it will be fabulous and I promise lots of pictures. Psst! If you haven’t already, sign up here for monthly updates. For the first time, I will be a part of the Greater Tulsa Indian Art Festival in Glenpool, Oklahoma February 5-7. The theme this year is “Honoring Our Veterans and Code Talkers”, and I am so excited to be a part of it. I’ve been working on a series of pots that honor the Choctaw Code Talkers of World Wars I and II just for this event. If you are not familiar with the term, “code talkers”, let me explain a bit. Near the end of World War I, Choctaw soldiers were asked to communicate sensitive military operations in their own language to assure the Germans could not crack the “code”. The success of this group of 19 Choctaws led to soldiers from a number of other American Indian tribes being asked to help. In World War II a number of tribes were enlisted and special training was given to assure accurate communications. For example, Choctaws used the phrase “Tanampo Chitto” (big gun) to indicate enemy artillery. In 2008, Congress finally authorized medals be struck to honor the Code Talkers and they were awarded in a ceremony in Washington, DC on November 20, 2013 – almost 70 years later. It will be exciting to see the works created to honor these fine men and all other Native veterans this weekend. If you are in the Tulsa area, or up for a road trip, come join us for a weekend showcasing Native American fine art and tradition. Please stop by and say hello! Excitement is building…Empty Bowls is coming February 19th! 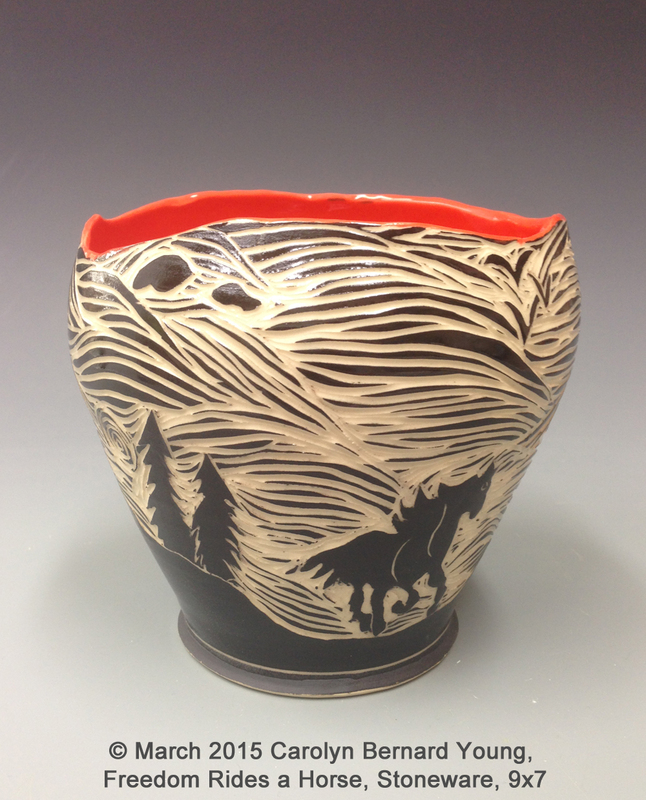 Artists all over the area have been busy all year making bowls that ticket holders will choose from. Potters, glass artists, wood turners, and other creatives donate some of their best work to support the Tarrant Area Food Bank in their efforts to feed the hungry in Tarrant County and twelve surrounding counties. But I have Too Much Stuff! Have you ever said this to an artist? “But I have too much stuff already!” Certainly many shoppers are thinking this as they salivate over work they would love to own, even if they don’t say it out loud. So I thought it might be helpful to show you some ways to use pottery around your home. Personally, I use pottery for everything! If there is a need for something to be held/contained, pottery is my go-to solution. What about you? 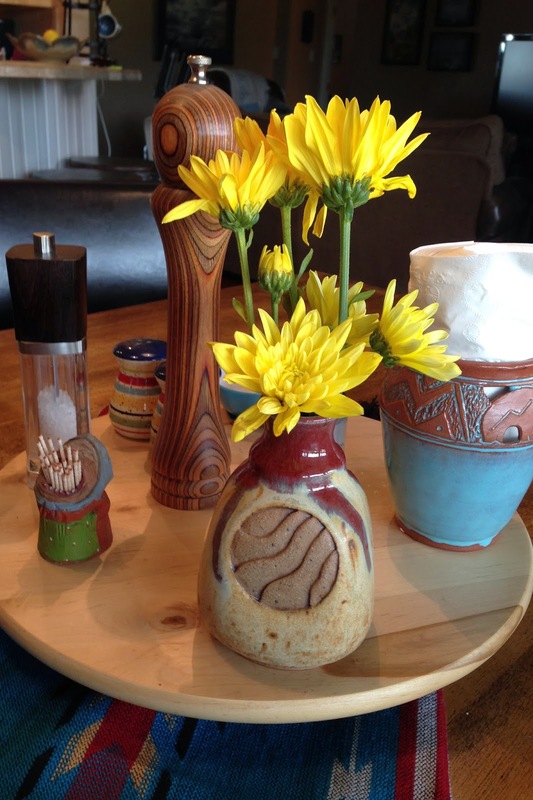 Would love to see your photos of how you use artist-made items to serve double duty at your house. Let’s start in the kitchen. Here are a few of photos to get you started – more in the next post. Flowers make me smile so I use pottery all over the house for little bunches of flowers. This little vase was purchased in Santa Fe but the artist didn’t sign it. In the background is one of my pierced pieces acting as a napkin holder. 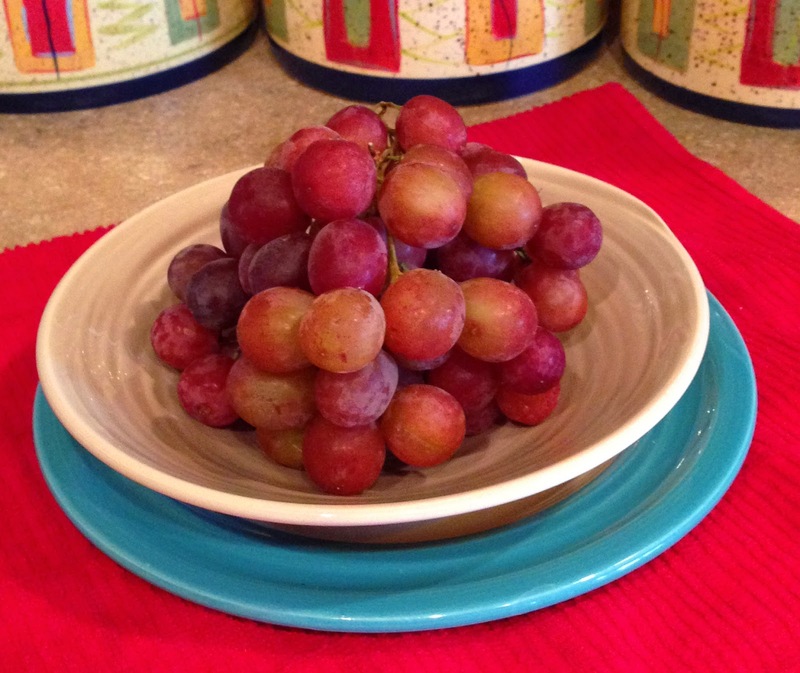 Grapes look even yummier on a lovely plate and bowl by Pamela Summers. Clockwise from top left: footed bowl by yours truly, lemons held by Ron Hollister bowl, bread in an Orby Chamblee woven pottery basket, and tomatoes in a wonderful bowl by Pamela McMahon. Larger view of my limited counter space – utensils are held by pots whose makers I no longer remember and are not signed.